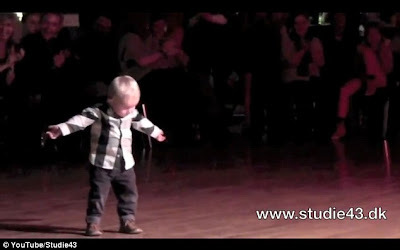 This 2 year old boy name William Stokkebroe showed his unforgettable talent to the crowd when he started to dance on the tune of King of Rock and Roll Elvis Presley song, 'Jailhouse Rock'. 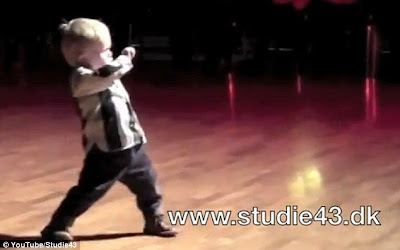 I'm sure, if you watch the video below, you will smile and laugh from start to the end of his dance performance. 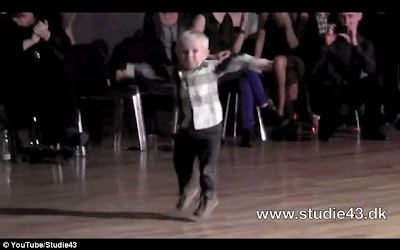 According to video's description, William learned the dance from his parents Kristina and Peter, who run dance studio "Studie43" in Denmark. The boy really knows what step to do as he wins the attention of the crowd by gyrating his hips, tapping his feet, clapping and lipsing to the hit song. William was really smart boy as he imitates Elvis's signature moves, and doing some of his own style. Please watch the video of the "2 year old dancing the jive" that have already 3,996,138 million hits, 16,326 likes and 1,400 comments on YouTube. Comments or suggestions about "2-year-old boy dances on the tune of Jailhouse Rock" is important to us, you may share it by using the comment box below.